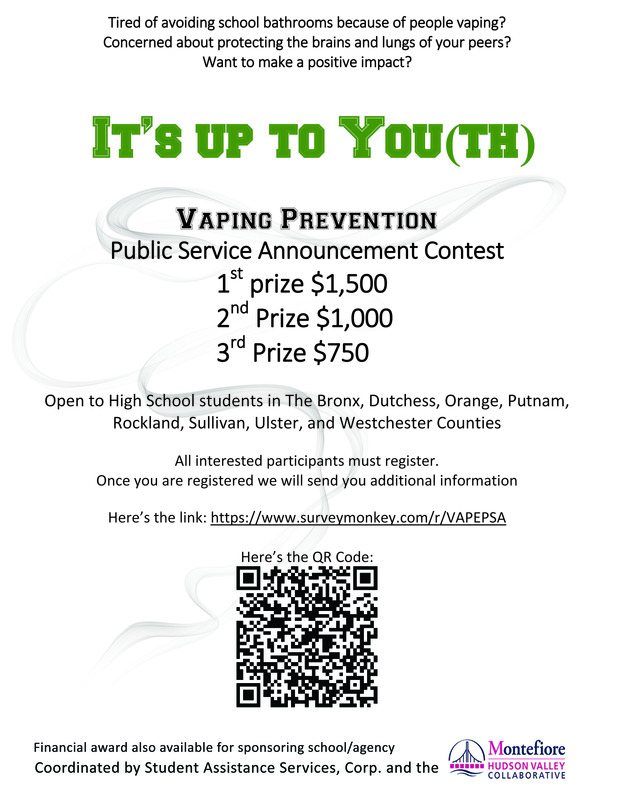 MHVC is sponsoring an exciting contest designed to empower high-school students across the Hudson Valley and the Bronx to spread the message about the harmful effects of e-cigarettes (“vaping”) to their peers. The “It’s Up to You(th)” Public Service Announcement (PSA) contest, coordinated by Student Assistance Services (SAS), was launched at SAS’s student leadership event in White Plains YMCA on November 28th, 2018. Sixty-five students from 32 Westchester Schools participated in a student leadership event held at the YWCA in White Plains. Students will submit short videos on the following themes: Most teens are NOT vaping; refusal skills (ways to say NO); how vaping ads target youth; and the costs of vaping to health. A presentation describing these effects, and the contest rules, can be viewed here. Submissions are due March 30, 2019; later in the spring, these short videos will be premiered and one will be chosen to win a grand prize of $1,500. Student Assistance Services (SAS) is a longstanding organization in Westchester County, established in 1985. Their mission is to provide support and training to a variety of members in the community — students, parents, educators, and more — in order to prevent substance use and bullying among high- and middle-schoolers. The National Youth Tobacco Survey (NYTS) found that there is an alarming increase in e-cigarette use among kids within the past year. Its widely-used poster (link here) illustrates a 78% increase in use among high school students and a 48% increase in use among middle school students from 2017 to 2018. 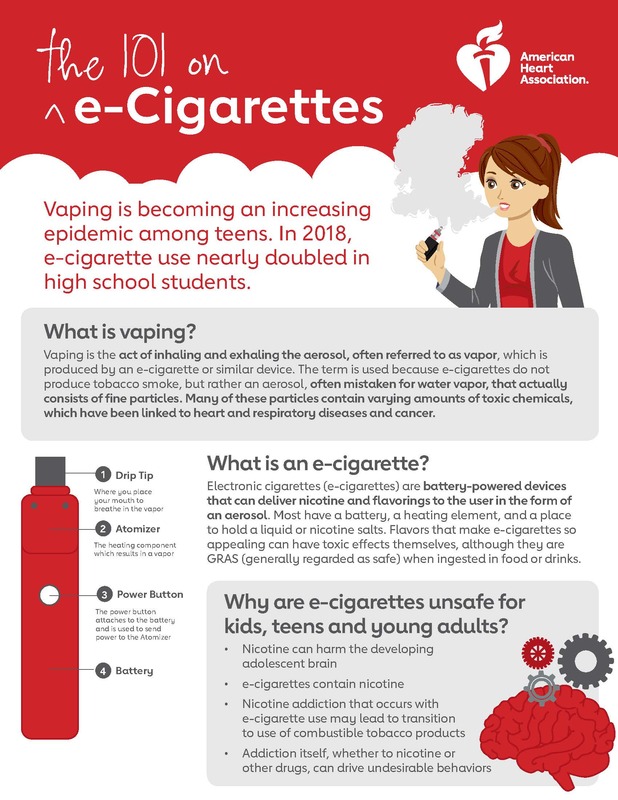 The initiative is part of coordinated strategy by MHVC that began last year with vaping training for pediatricians and parents, and will reach a key milestone at the May PSA “Red Carpet” award ceremony. 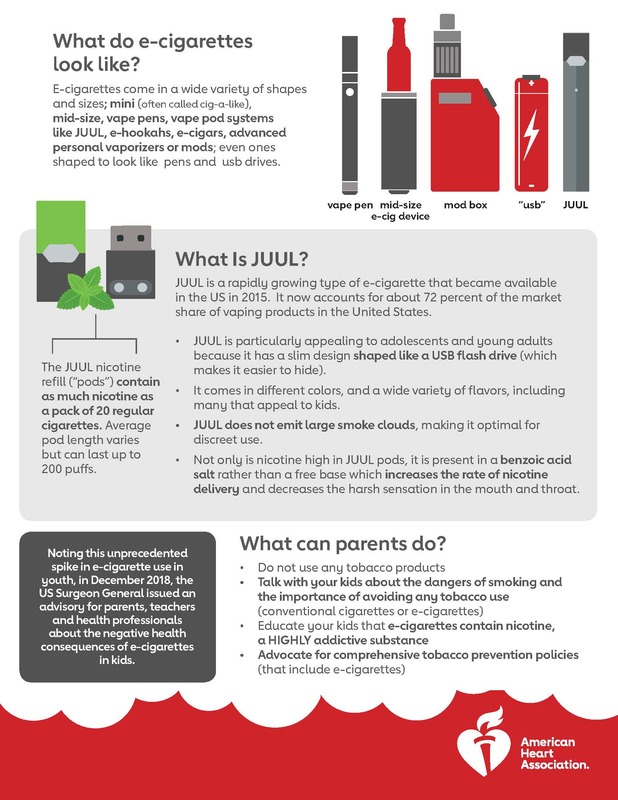 MHVC will continue its anti-vaping campaign by disseminating the winning PSAs on social media and communications platforms, and making information available to partners, such as these “101 on e-cigarettes” posters here and here. Judy Mezey, Director of Community Based Programs at SAS, said “To me, it’s not the kids that are the problem, it’s the adults. Young people are doing what their brains are wired to do: they’re looking for risks, they’re looking to fit in. This crisis is a product of what we adults have created.” Mezey is hopeful that this type of programming and the support that SAS offers will help change things, starting with the students who attended this meeting. “I love working with student leaders; you just have to help amplify their voices.” For more information, contact judy.mezey@sascorp.org. © 2018 Montefiore Hudson Valley Collaborative. All Rights Reserved.